KUALA LUMPUR (Nov 8): Home-grown technology-based company Red Ideas Holdings Bhd, which develops the private community platform Graaab JaGaApp, made an impressive debut on the Leading Entrepreneur Accelerator Platform (LEAP) Market today. At midday break, Red Ideas was up 27.14% or 9.5 sen to 44.5 sen, with 854,000 shares traded. In a statement today, Red Ideas’ Chairman Datuk Gooi Hoe Soon said the group intends to expand its marketing force to reach out to as many communities as possible. “Our ability to provide innovative products, coupled with our consistent level of reliable after-sales services, has been instrumental in attracting new customers,” Gooi said. In addition to growing the community base, the group is also looking to increase the variety and quality of services and products offered by third party service providers, through its “MyServices” feature. Gooi said there is vast potential for growth for Red Ideas’ Graaab JaGaApp product deployment as the niche industry that Red Ideas is operating in, is still in its infancy stage. Red Ideas intends to capitalise on its first mover advantage and to capture as much market share as possible, while continue innovating its product offerings, Gooi said. “One of our plans is to penetrate new markets, be it locally or overseas. Domestically, we are already establishing our foothold in Klang Valley, Seremban, Penang, Melaka and Johor. Currently, Red Ideas has more than 110 communities under its Graaab JaGaApp portfolio which it hopes to continue to grow to 500 within the next two years,” he added. Additionally, Red Ideas is also looking to make forays abroad and have identified Singapore and Australia as potential ventures. The group is currently studying the feasibility and strategy on its expansion into these markets. 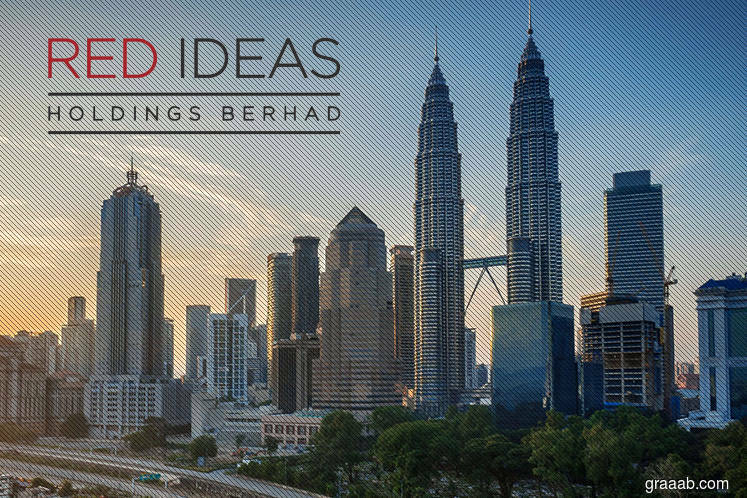 Red Ideas had raised RM7 million via private placement of 20 million shares at an issue price of 35 sen per share to selected investors. Of the total placement proceeds, RM4.15 million (59.3%) will be used mainly for general working capital to finance the company’s day-to-day operations, including working capital requirements; RM1 million (14.3%) for research and development of its existing and new products in terms of both software and proprietary hardware; and RM1 million (14.3%) for office expenses/renovation and to set up new branch offices, while the remaining RM850,000 (12.1%) will be used to defray listing expenses for the initial public offering (IPO). Based on the enlarged share capital of 100 million shares and the IPO price of 35 sen per share, the company’s market capitalisation is RM35 million upon listing.